Tom Freeman's paintings are well known all over the world. 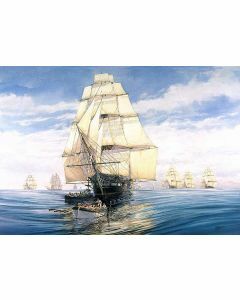 He is best known for his depictions of stunning naval scenes. 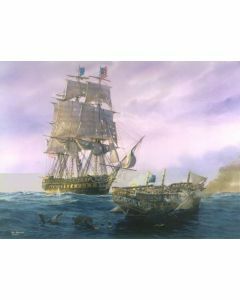 His professional art career began after he left the US Marine Corps in 1977. Mr. Freeman's work has appeared on many magazines such as Readers Digest, Popular Mechanics, Boating, Yachting, Business Week, and even TV Guide. His work has been placed on porcelain plaques and plates for Franklin Mint and the Hamilton Group. Many of his original paintings and limited edition prints hang in the White House, Vatican City, Arizona Memorial in Honolulu, Hawaii, Immigration/Clandestine and Naval Museum in Haifa, and many other places of note. He has done work for the National Parks Service and many corporations through out the world. Tom has been selected as the first artist in residence to the United States Naval Institute. Special note: Due to Mr. Freeman's recent untimely passing, his prints are now being signed by Ann Freeman his wife of many years.